There was some experimentation this weekend, some of which didn’t work and the rest of which were… learning opportunities. I got the last slat planed to thickness, but lost one along the way because I couldn’t get it to thickness, there was a split in it from poor resawing that was diving down below the minimum line and it wasn’t recoverable. So next week I’ll take another 30″ off the ash board I have, plane it flat, hack it into 2″ wide laths, and resaw them down and wow does this ever teach you why we invented bandsaws. Honestly, it’s getting silly now. I’ve lost two clamps to it. Seriously, somewhere under there is a sash clamp, a lidl F-clamp, four boxes of lawn seed and a container of round-up. And normally you’d just use a broom, but the space is so small and restricted that a broom would honestly be more hassle than help. So I got an aldi wet-and-dry shop vac and tried that, but while it could grab the dust and some shavings, the shavings clogged it up pretty fast. Well, there’s a solution to that – it’s a thing called a cyclone seperator. Think of a conical funnel with a lid on it. 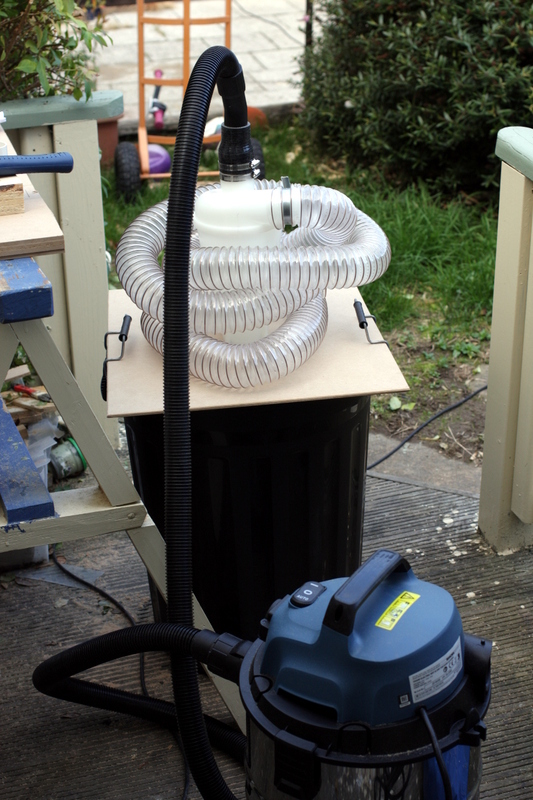 The vacuum connects to the lid, and you connect another hose to the side of the funnel angled to cause the incoming stream of stuff to spin, whereupon is slows down and drops to the bottom of the funnel and into a barrel mounted there. The other experiment, which went slightly better, was to test steambending walnut. 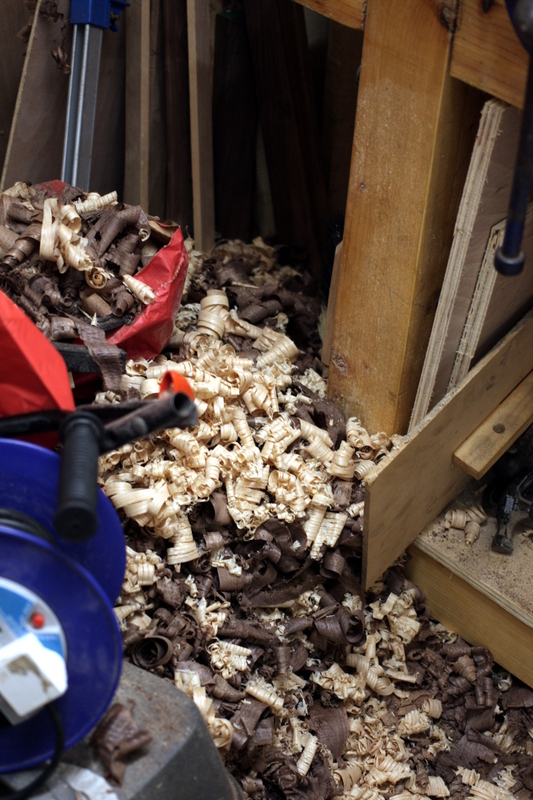 The idea is simple – wood is stiff because of a (fairly complex) chemical called lignin. It melts around 150C (well, there are several melting temperatures because your average tree will have lots of slightly different lignins – apparently it’s a challange for people studying the stuff to seperate them out, there are so many), but it will soften around 100C which is a nice convenient temperature as you just have to generate steam and that’s fairly easy. BTW, if you’ve not seen this guy’s channel, go there now, it’s fascinating stuff. 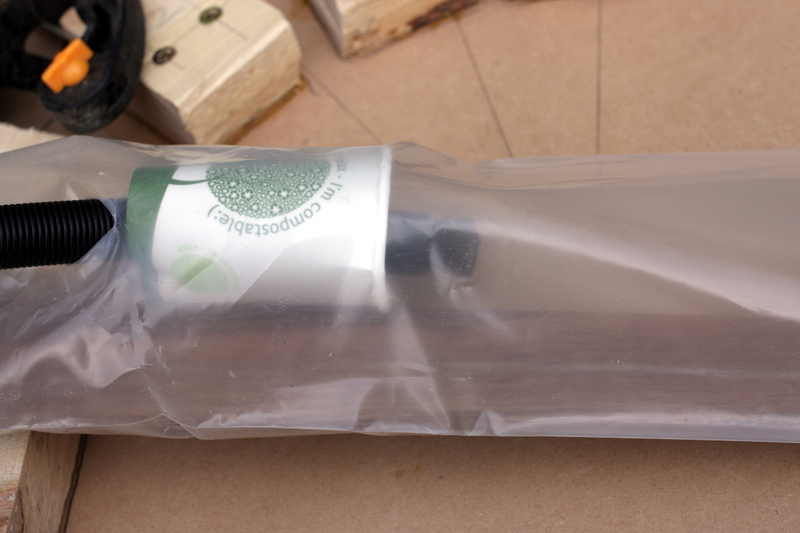 But anyway, his genius idea is to encase the wood in a plastic tube – specifically, the kind of continuous poly tube that you’d make smaller bags out of using a heat sealer – and pump the steam into that tube. That lets him put the wood in the jig, steam it for an hour, then bend it while still steaming it and hold it in the bent shape in the jig while still steaming it and then control the cooling-off process. Apart from the benefit of being able to work on long timbers for boat hulls, which is his thing, he gets lots of other bonuses, like being able to take his time doing the actual bending, controlling the temperature seperately from the bending process, and being able to keep the lignin softened even after the bend is done, and letting the stresses in the bent wood settle out before letting the lignin harden. This leads to far less spring-back to cope with. I took one look at this and thought that’ll do. So I get a wallpaper stripper, some poly tube (it’s very cheap on ebay) and some metal plumber’s steel strap and prep to get bending. 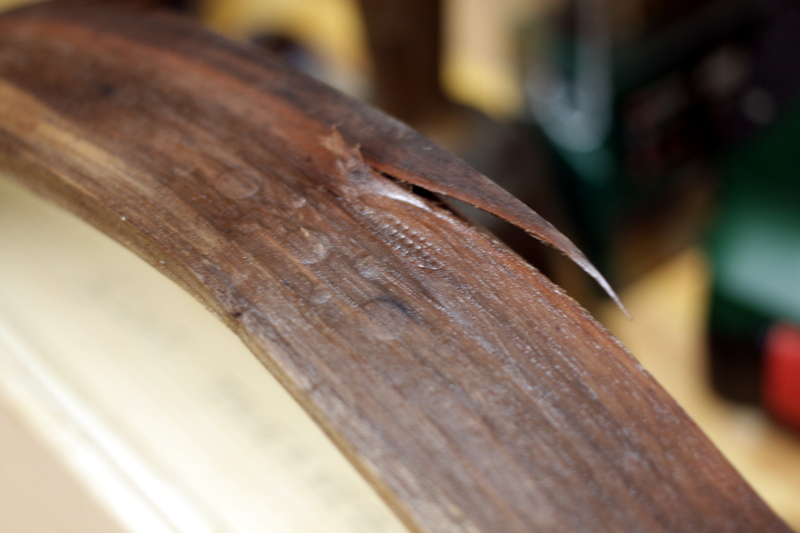 The strap is needed to go around wood on the outside of the curve – the reason the wood is bending at all is that with the lignin softened, you can compress and collapse the inside of the curve. You can’t stretch wood y’see, it’ll snap and splinter if you try, so the strap keeps the outside from stretching and the inside in compression. 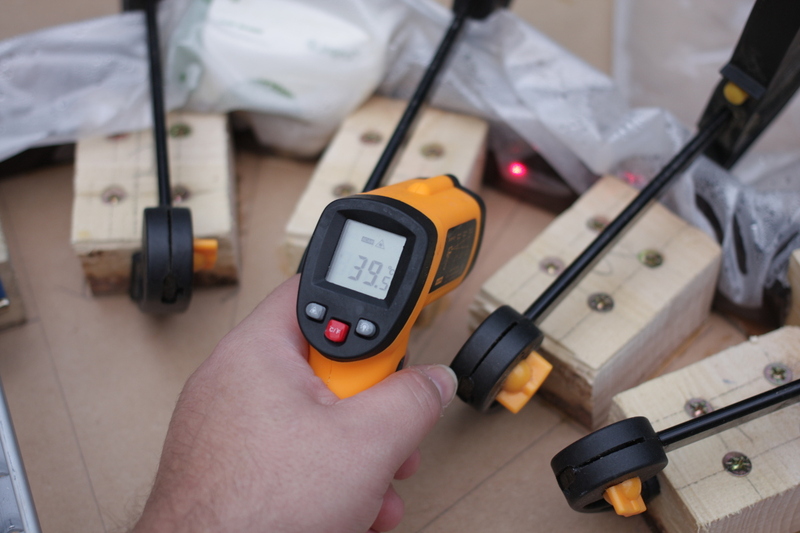 This was, incidentally, one of the mistakes I made – I forgot the strap until the wood had been steaming for a half-hour and had to make up and apply the strap while the wood was around 100C. That does not lead to fine tolerances and unrushed work. 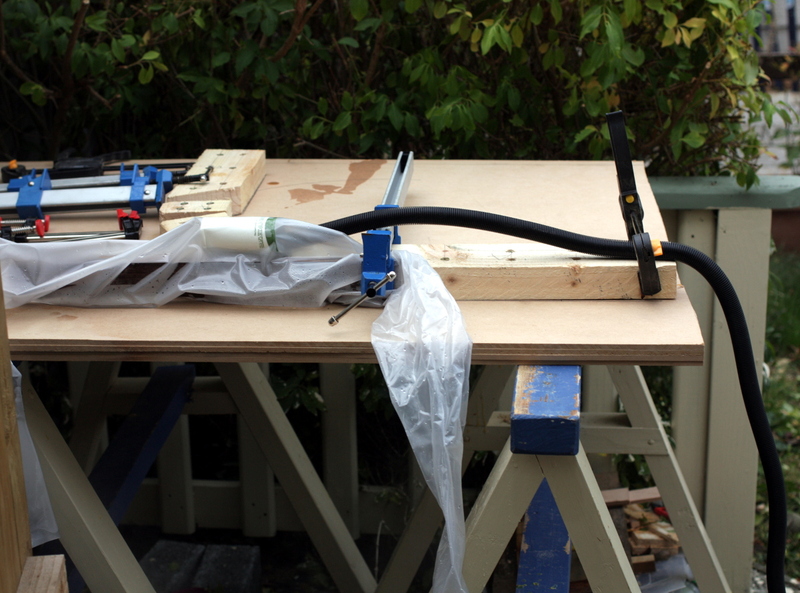 The first step though was to build the jig, so I needed a flat surface and some blocks around the curve to clamp to. I had a few sheets of MDF that I don’t really want to save for anything because honestly, MDF is awful. 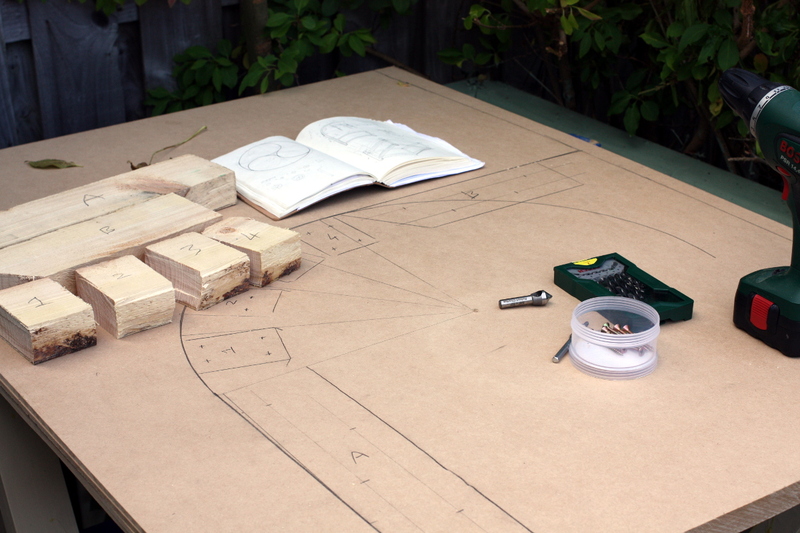 So I glued enough together to give me an inch-thick slab of MDF, and I started laying out where the blocks should go. Then lots of drilling, a quick run to woodies because none of the screws I had were up to the job, and then screw&glue the blocks in place. That may have been a mistake, but not an unrecoverable one; I’ll need to disassemble the jig and rebuild it, but a solid belt of a hammer might fix that glue problem. Then put the walnut offcut I’m testing with into the tube, being sure I had a half-meter off either end, and put in a spacer (in this case a paper cup) to stop the tube from collapsing on top of the steam pipe and melting because of a high concentration of moisture and heat. And then it’s just a case of clamping one end of the wood into the jig, filling the wallpaper stripper with water and plugging it in. It takes 20 minutes or so to get up to 100C and then start steaming, then I wait an hour (actually a little bit more because the steamer ran out of water before I was expecting it to and it took a few minutes to refill it so the temperature dropped for ten minutes), and then I start bending. 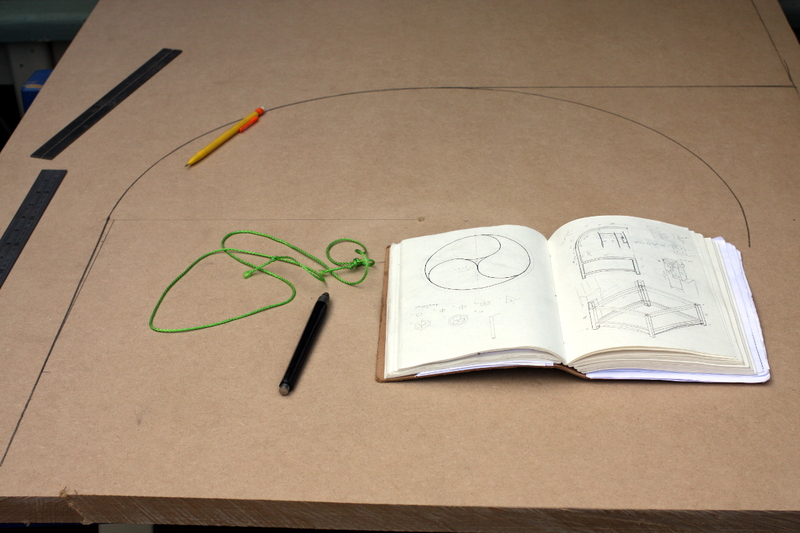 The bending itself is not exactly a delicate operation. You don’t quite get out the hammers, but you put on gloves and oven mitts, grab the wood and then it’s just muscle to pull it into the bend. 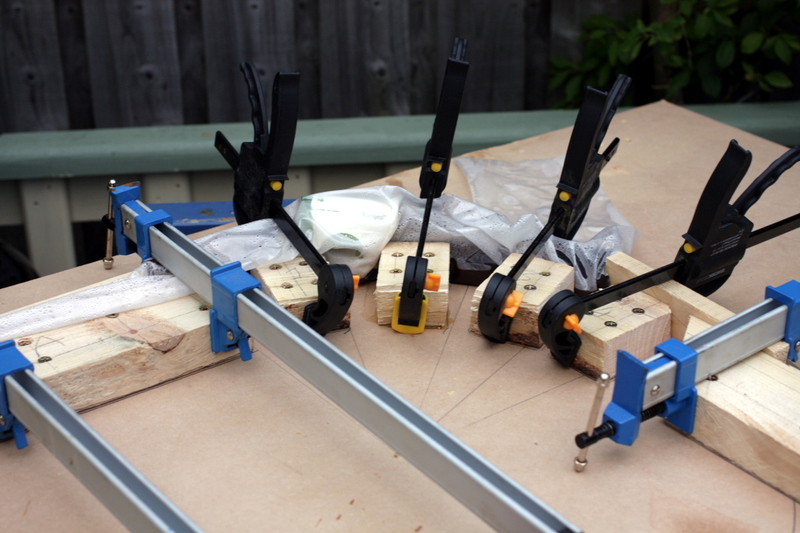 You grab it with clamps as you go and then it’s a case of pull it to bend it a bit, tighten the clamps to hold that, then pull some more and pretty soon you’ve got the bend in. If you’ve not heard any loud splintering noises, you’re good. Now leave the steamer finish off the last of the water that’s in it, so another half hour or so of steaming, and then unplug the steamer and start letting it cool down. Now there are a few mistakes I’ve made here. For a start, I forgot the compression strap until half-way through the steaming and had to put it on outside the bag. 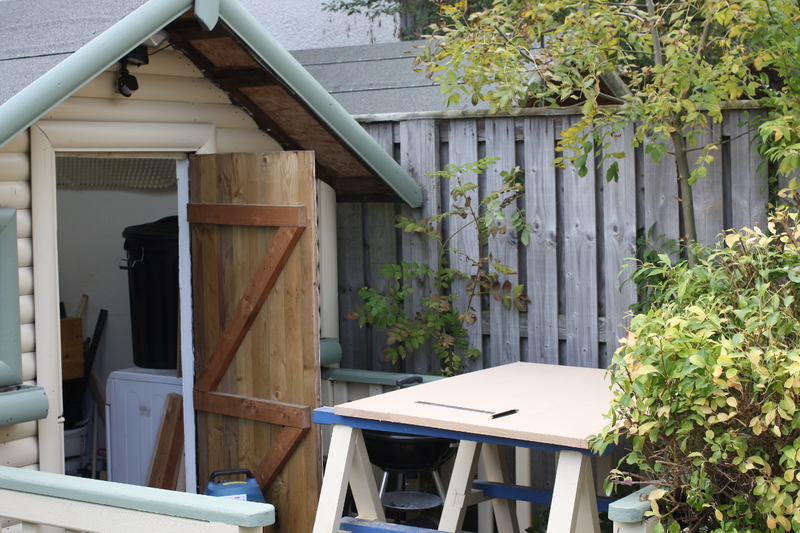 It’s also not the full width of the piece being bent, so a good bit of the wood is not supported. And then there’s the point that there’s no scrap bits of wood between the clamps and the wood being bent (and of course, as the wood is being softened, the clamps really dig in and deform the wood. On the left, the supported and properly bent walnut (still quite damp); on the right, the unsupported part that split. Still though, I’m not too unhappy. I know what to do now for the real thing. But first, I want to watch that experimental bit for a few days to see how much it springs back and how much overbend I’ll need. I will need to rebuild the jig though – those blocks are not tall enough off the mdf to do the job and need to be redone. 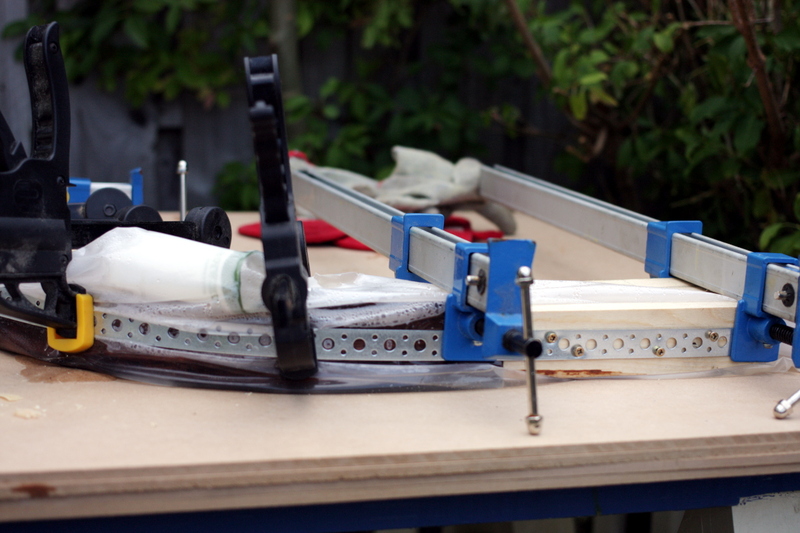 I’ll also want to make up a proper compression strap setup and some scrap bits to protect the walnut from the clamps.